Members and Officers of the Young Liberals and Democrats of Asia poses with 'Liberalism and Fundamentalism' banner. November 3 to 8, 2004 marked a special event in the city of temples, Kathmandu, Nepal. – the annual conference of the Young Liberals and Democrats of Asia (YLDA). Prior to the group’s second general meeting, YLDA conducted a workshop on “Liberalism and Fundamentalism” for 27 participants from different parts of Southeast, East and South Asia. 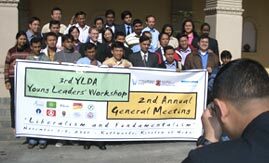 Besides YLDA members, youth leaders from India, Pakistan and Thailand took part in the activity that was sponsored by the Friedrich-Naumann-Foundation. Moderated by Dr. Ronald Meinardus, the resident representative of the liberal Foundation in the Philippines, the workshop focused on one of the burning issues Asian Liberals have to face: Fundamentalism and the need to address it from a liberal perspective. Workshop participants started by defining fundamentalism and exploring the wide range of forms it takes - from religious fundamentalism to political and other forms of intolerance. The workshop then went on and discussed liberal strategies to confront the different forms of fundamentalism. Aside from the discussions, the workshop also included breakout sessions that allowed participants to interact and exchange experiences with each other. Following the workshop was the second YLDA general meeting. Members reelected Jonathan Malaya from the Philippines as president. Rajendra Mulmi from the hosting organization Youth Initiative was also reconfirmed as secretary general by the delegates. The YLDA-delegates considered the applications of two new members: Future Youth Group Pakistan and the Young Democrats Thailand. The eventful week ended with the Asian Youth Conference where delegates interacted with 70 Nepali youths. They exchanged experiences and ideas on the topic: “Challenges and Opportunities for Youth of Asia”. “YLDA has come a long way since its inception two years ago”, said Dr. Ronald Meinardus, who has coordinated the liberal Foundation’s regional youth activities for the past years. The next task ahead will be the setting up of a permanent secretariat. Earlier, YLDA had decided to establish an office in Manila.